While Garney Henley appeared to be one of the least likely candidates for super stardom, but the slender young man from South Dakota excelled at both defence and offence. Henley played 216 games in 12 seasons and missed only two games in his final season. He intercepted 59 passes for 916 yards and 5 touchdowns. He is one of only a few players to catch four touchdown passes in a single game. 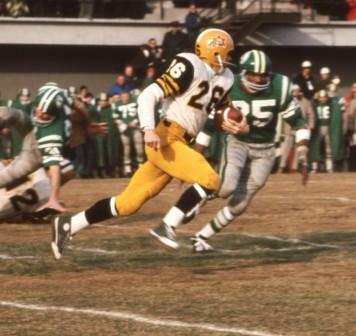 Garney Henley was nominated six times for the Schenley Most Outstanding Player Award, and was named to the Tiger-Cats’ Best-of-the-Century Team in 1967. Garney Henley is a member of the National Association of Intercolligate Athletics Hall of Fame, University of Guelph Athletics Hall of Fame, and the College Football Hall of Fame.